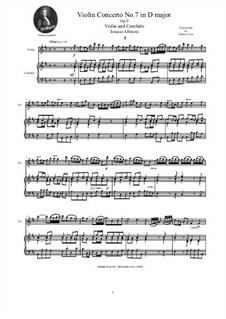 Version for Violin and Piano of the Concerto No.1 in B flat major, transcribed in 2017 by Santino Cara for " 12 Concertos Op.9" composed in 1722 around by Tomaso Albinoni. With the complete score of the concert is also inserted the separate violin part. Complete score and parts of the "Violin Concerto No.1 in B flat major" for Violin concertante, Strings and Cembalo. Reconstructed and elaborated by Santino Cara from "12 Concertos Op.9" by Tomaso Albinoni. Source: Reconstruction from first edition published in 1722 by Michel-Charles Le Cene of Amsterdam in "12 Concertos Op.9" and kept at the "Library of the Music Conservatory San Pietro a Majella" in Naples (Italy). 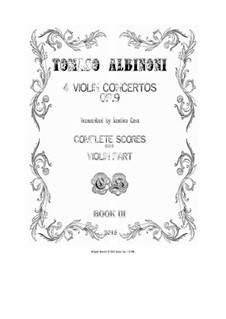 Complete score and parte of the "Violin Concerto No.1 in B flat major Op.9" for Violin and Cembalo" by Tomaso Albinoni. Transcribed by Santino Cara. Concerto No.2 in D minor for Oboe, Strings and Continuo(cembalo), elaborated by Santino Cara from the "12 Concertos to 5 for violin, oboes and strings Op.9" of Tomaso Albinoni. With the complete score of the concerto they are inserted also the separate parts. 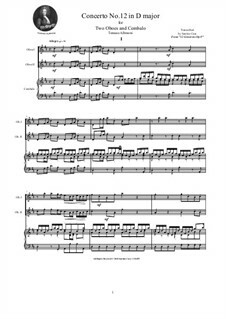 Version for Oboe (or Flute) and Piano of the "Concerto No.2 in D minor" transcribed by Santino Cara from the "12 Concertos to 5 for violin oboes and strings Op.9" of Tomaso Albinoni. With the complete score of the concerto is inserted also the separate oboe part. 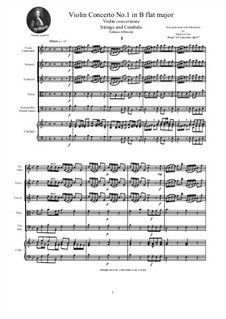 Version for Oboe (or Flute) and String Quartet of the "Concerto No.2 in D minor" transcribed by Santino Cara from the "12 Concertos to 5 for violin oboes and strings Op.9" of Tomaso Albinoni. 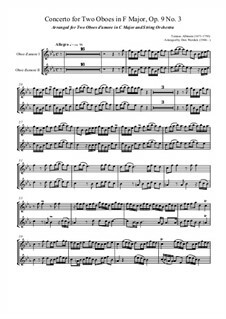 Complete score and parts of the "Oboe Concerto No.3 in F major" for Two Oboes, Strings and Cembalo. Reconstructed and elaborated by Santino Cara from "12 Concertos Op.9" by Tomaso Albinoni. 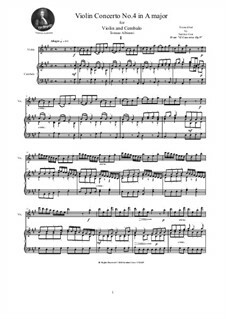 Complete score and parts of the "Oboe Concerto No.3 in F major" for Two Obes and Cembalo. Transcribed by Santino Cara from "12 Concertos Op.9" by Tomaso Albinoni. Chamber Ensemble of Minnesota, Inc. 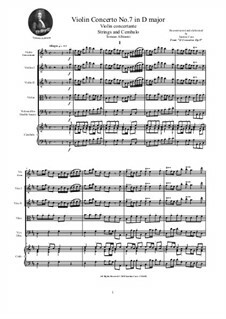 Complete score and parts of the "Concerto for Two Oboes in F Major and String Orchestra, Op. 9, No. 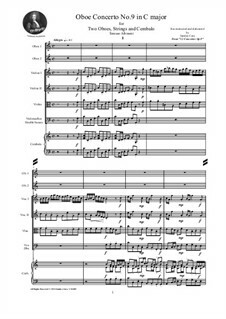 3", by T. Albinoni, arranged by D. Werdick for Two Oboes d'amore in C Major and String Orchestra. 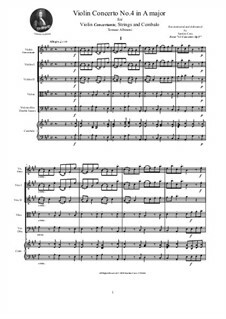 Complete score and parts of the "Concerto for Two Oboes in F Major and String Orchestra, Op. 9, No. 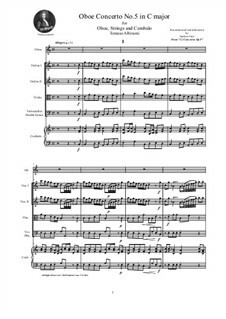 3", by T. Albinoni, arranged by D. Werdick for Two English horns and String Orchestra. Complete Oboe d’amore I & II combined solo parts and individual solo parts of the “Concerto for Two Oboes in F Major, Op. 9 No. 3 and String Orchestra" by T. Albinoni, arranged by D. Werdick for Two Oboes d’amore in C Major. Complete English horn I & II combined solo parts and individual solo parts of the “Concerto for Two Oboes in F Major, Op. 9 No. 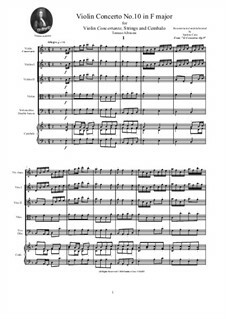 3 and String Orchestra", by T. Albinoni, arranged by D. Werdick for Two English horns.. 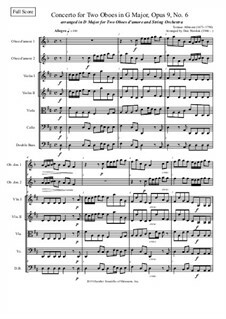 Complete Oboe I & II combined solo parts and individual solo parts of the “Concerto for Two Oboes in F Major, Op. 9 No. 3 and String Orchestra", by T. Albinoni, arranged by D. Werdick. 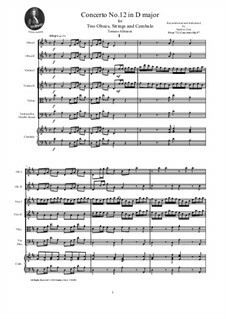 Complete score and parts of the "Concerto for Two Oboes in F Major and String Orchestra, Op. 9, No. 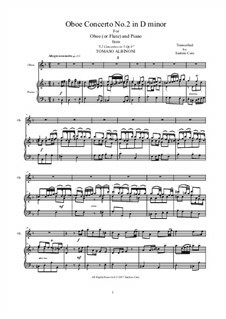 3", by T. Albinoni, arranged by D. Werdick. Complete score and parts of the "Violin Concerto No.4 in A major" for Violin concertante, Strings (ripieni) and Cembalo. Reconstructed and elaborated by Santino Cara from "12 Concertos Op.9" by Tomaso Albinoni. 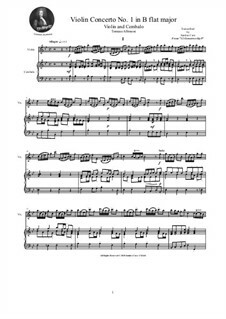 Complete score and part of the "Violin Concerto No.4 in F major" for Violin and Cembalo. 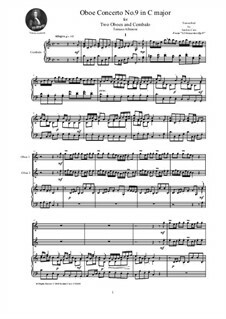 Transcribed by Santino Cara fro "12 Concertos Op.9" by Tomaso Albinoni. 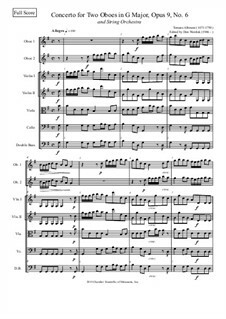 Complete score and parts of the "Oboe Concerto No.5 in C major" for Oboe, Strings and Cembalo. Reconstructed and elaborated by Santino Cara from "12 Concertos Op.9" by Tomaso Albinoni. 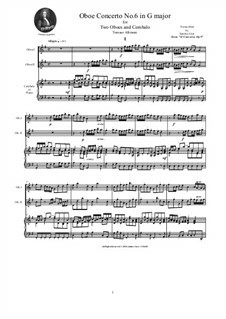 Complete score and part of the "Oboe Concerto No.5 in C major" for Oboe and cembalo. 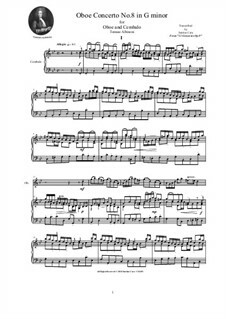 Transcribed by Santino Cara from "12 Concertos Op.9" by Tomaso Albinoni. 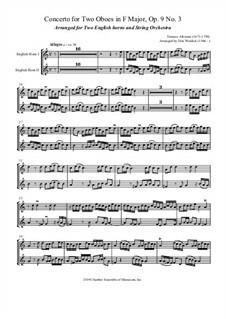 Complete score and parts of the "Oboe Concerto No.6 in G major" for Two Oboes, Strings and Cembalo. Reconstructed and elaborated by Santino Cara from "12 Concertos Op.9" by Tomaso Albinoni. Complete score and parts of the "Oboe Concerto No.6 in G major" for Two Oboes and Cembalo. Transcribed by Santino Cara from "12 Concertos Op.9" by Tomaso Albinoni. Complete Oboe d’amore I & II combined solo parts and individual solo parts of the “Concerto for Two Oboes in G Major, Op. 9 No. 6 and String Orchestra, by T. Albinoni, arranged by D. Werdick for Two Oboes d’amore in D Major. Complete score and parts of the "Concerto for Two Oboes in G Major, Op. 9, No. 6 and String Orchestra" by T. Albinoni, arranged by D. Werdick for Two Oboes d'amore in D Major and String Orchestra. Complete score and parts of the "Concerto for Two Oboes in G Major" and String Orchestra, Op. 9, No. 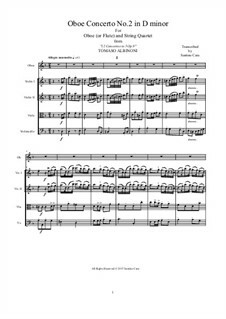 6", by T. Albinoni, arranged by D. Werdick for Two English horns. 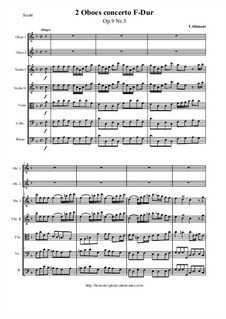 Complete English horn I & II combined solo parts and individual solo parts of the “Concerto for Two Oboes in G Major, Op. 9 No. 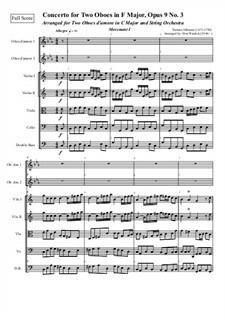 6 and String Orchestra", by T. Albinoni, arranged by D. Werdick for two English horns. Complete score and parts of the “Concerto for Two Oboes in G Major, Op. 9 No. 6 and String Orchestra, by T. Albinoni, edited by D. Werdick. 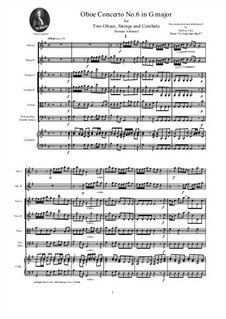 Complete Oboe I & II combined solo parts and individual solo parts of the “Concerto for Two Oboes in G Major, Op. 9 No. 6 and String Orchestra, by T. Albinoni, edited by D. Werdick. 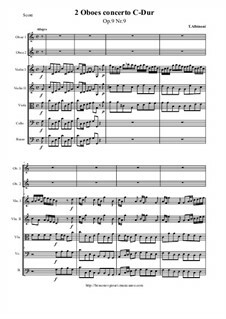 Complete score and parts of the "Violin Concerto No.7 in D major" for Violin concertante, Strings and Cembalo. Reconstructed and elaborated by Santino Cara from "12 Concertos Op.9" by Tomaso Albinoni. Movements: 1. 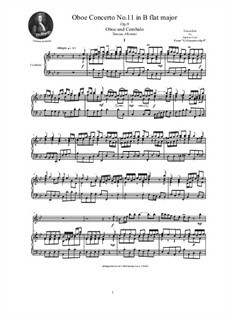 Allegro, 2. Andante lento e piano, 3. Allegro. 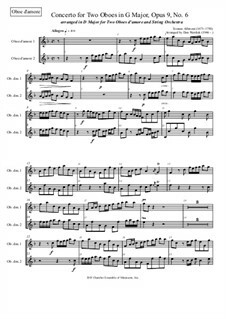 Source: The reconstruction of this concerto, was realized from the first edition of 1722 of "12 Concerti Op.9" composed by Tomaso Albinoni between 1714 and 1720 published by Michel-Charles Le Cène of Amsterdam. 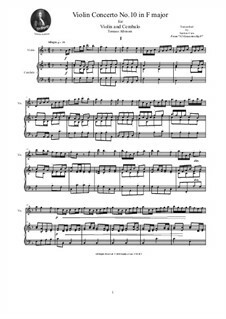 Complete score and part of the "Violin Concerto No.7 in D major" for Violin and Cembalo. Transcribed by Santino Cara from "12 Concertos Op.9" by Tomaso Albinoni. 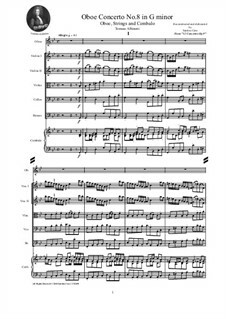 Complete score and parts of the "Oboe Concerto No.8 in G minor" for Oboe, Strings and Cembalo. Reconstructed and elaborated by Santino Cara from "12 Concertos Op.9" by Tomaso Albinoni. 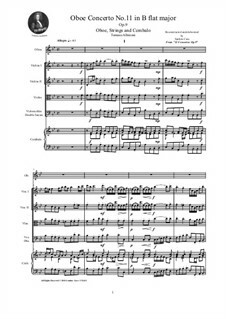 Complete score and part of the "Oboe Concerto No.8 in G minor" for Oboe and Cembalo. Transcribed by Santino Cara from "12 Concertos Op.9" by Tomaso Albinoni. Movements: 1. Allegro, 2. Adagio, 3. Allegro. 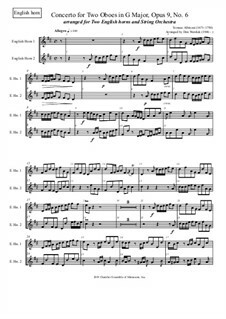 Complete core and parts of the "Oboe Concerto No.9" in C major for Two Oboes, Strings and Cembalo. Reconstructed and elaborated by Santino Cara from "12 Concertos Op.9" by Tomaso Albinoni. Source: This concert was rebuilt from the first edition of 1722 published in Amsterdam by the publisher Michel-Charles Le Cène. 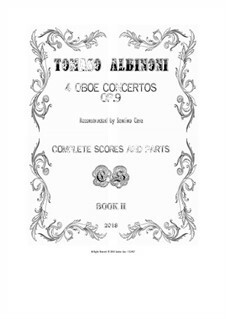 Complete score and parts of the "Oboe Concerto No.9 in C major" for Two Oboes and Cembalo. Transcribed by Santino Cara fro "12 Comcertos Op.9" by Tomaso Albinoni. 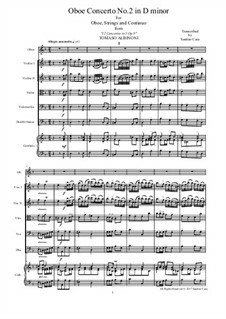 Complete score and parts of the "Violin Concerto No.10 in F major" for Violin concertante, Strings and Cembalo. Reconstructed and elaborated by Santino Cara from "12 Concertos Op.9" by Tomaso Albinoni. 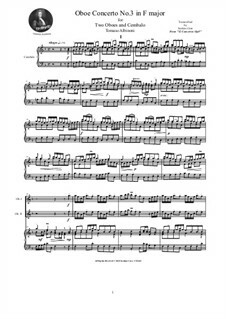 Complete score and part of the "Violin Concerto No.10 in F major" for Violin and Cembalo. Transcribed by Santino Cara from "12 Concertos Op.9" by Tomaso Albinoni. Complete score and parts of the "Oboe Concerto No.11 in B flat major" for Oboe, Strings and Cembalo. Reconstructed and elaborated by Santino Cara from "12 Concertos Op.9" by Tomaso Albinoni. 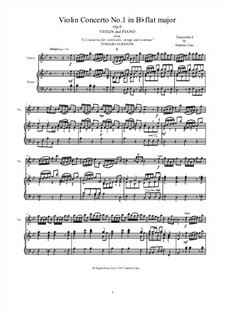 Complete score and part of the "Oboe Concerto No.11 in B flat major" for Oboe and Cembalo or Piano. Transcribed by Santino Cara from "12 Concertos Op.9" by Tomaso Albinoni. 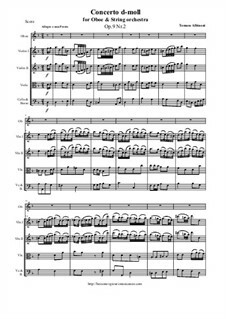 Complete score and parts of the "Oboe Concerto No.12 in D major" for Two Oboes, Strings and Cembalo. Reconstructed and elaborated by Santino Cara from "12 Concertos Op.9" by Tomaso Albinoni. 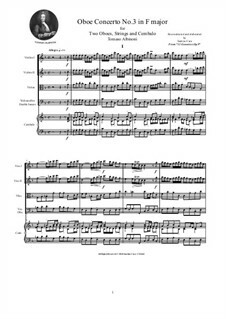 Complete score and parts of the "Oboe Concerto No.12 in D major" for Two Oboes and Cembalo. Transcribed by Santino Cara from "12 Concertos Op.9" by Tomaso Albinoni. 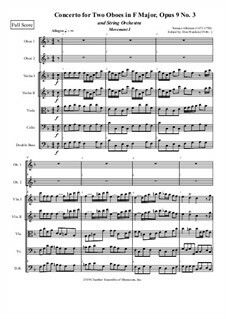 Complete scores and parts of "Four Violin Concertos" for Violin concertante, Strings and Cembalo. Reconstructed and elaborated by Santino Cara from "12 Concertos Op.9" by Tomaso Albinoni. 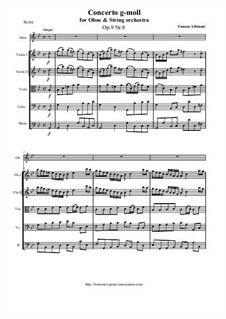 Complete scores and parts of "Four Concertos Op.9 Nos.2/5/8/11" for Oboe, Strings and Cembalo. Reconstructed and elaborated by Santino Cara from "12 Concertos Op.9" by Tomaso Albinoni. 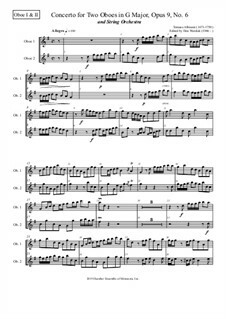 Complete scores and part of "Four Oboe Concertos" for Oboe and Cembalo. Transcribed by Santino Cara from "12 Concertos Op.9" by Tomaso Albinoni. Complete scores and parts of "4 Double Concertos Nos. 3,6,9,12, Op.9" for Two Oboes and Cembalo. 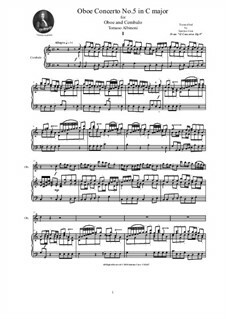 Transcribed by Santino Cara from "12 Concertos Op.9" by Tomaso Albinoni. 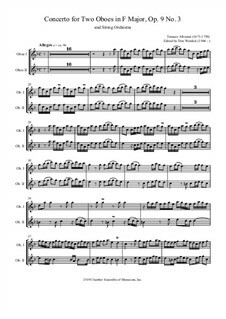 Complete scores and part of "4 Violin Concertos" for Violin and Cembalo. Transcribed by Santino Cara from "12 Concertos Op.9" by Tomaso Albinoni. Concerto No.1 in B Flat Major, for violin and piano Arrangiert von Cara S.
Concerto No.1 in B Flat Major - score, parts Arrangiert von Cara S.
Concerto No.1 in B Flat Major, for violin and cembalo (or piano) Arrangiert von Cara S.
Concerto No.2 in d minor - score and parts Arrangiert von Cara S.
Concerto No.2 in d minor, for oboe or flute and piano Arrangiert von Cara S.
Concerto No.2 in d minor, for oboe or flute and string quartet Arrangiert von Cara S.
Concerto No.3 in F major - score and parts Arrangiert von Cara S.
Concerto No.3 in F major, for two oboes and cembalo (or piano) Arrangiert von Cara S.
Concerto No.3 in F major, for two oboes d'amore and string orchestra (in C Major) Arrangiert von Werdick D.
Concerto No.3 in F major, for two english horns and string orchestra Arrangiert von Werdick D.
Concerto No.3 in F major, for two oboes d'amore and string orchestra (in C Major) – oboe part Arrangiert von Werdick D.
Concerto No.3 in F major, for two english horns and string orchestra – cor anglais part Arrangiert von Werdick D.
Concerto No.3 in F major, for two oboes and string orchestra – oboes part Arrangiert von Werdick D.
Concerto No.3 in F major, for two oboes and string orchestra Arrangiert von Werdick D.
Concerto No.4 in A major - score and parts Arrangiert von Cara S.
Concerto No.4 in A major, for violin and cembalo (or piano) Arrangiert von Cara S.
Concerto No.5 in C major - score and parts Arrangiert von Cara S.
Concerto No.5 in C major, for oboe and cembalo (or piano) Arrangiert von Cara S.
Concerto No.6 in G major - score and parts Arrangiert von Cara S.
Concerto No.6 in G major, for two oboes and cembalo (or piano) Arrangiert von Cara S.
Concerto No.6 in G major, for two oboes d'amore and string orchestra (in D major) Arrangiert von Werdick D.
Concerto No.6 in G major, for two oboes d'amore and string orchestra (in D major) – oboe part Arrangiert von Werdick D.
Concerto No.6 in G major, for two english horns and strings Arrangiert von Werdick D.
Concerto No.6 in G major, for two english horns and strings – english horns parts Arrangiert von Werdick D.
Concerto No.6 in G major, for two oboes and string orchestra Arrangiert von Werdick D.
Concerto No.6 in G major, for two oboes and string orchestra – oboe parts Arrangiert von Werdick D.
Concerto No.7 in D major - score and parts Arrangiert von Cara S.
Concerto No.7 in D major, for violin and cembalo (or piano) Arrangiert von Cara S.
Concerto No.8 in G minor - score and parts Arrangiert von Cara S.
Concerto No.8 in G minor, for oboe and cembalo (or piano) Arrangiert von Cara S.
Concerto No.9 in C major - score and parts Arrangiert von Cara S.
Concerto No.9 in C major, for two oboes and cembalo (or piano) Arrangiert von Cara S.
Concerto No.10 in F major - score and parts Arrangiert von Cara S.
Concerto No.10 in F major, for violin and cembalo (or piano) Arrangiert von Cara S.
Concerto No.11 in B Flat Major - score and parts Arrangiert von Cara S.
Concerto No.11 in B Flat Major, for oboe and cembalo (or piano) Arrangiert von Cara S.
Concerto No.12 in D major - score and parts Arrangiert von Cara S.
Concerto No.12 in D major, for two oboes and cembalo (or piano) Arrangiert von Cara S.
Concertos Nos.1, 4, 7, 10 - scores and parts Arrangiert von Cara S.
Concertos Nos.2, 5, 8, 11 - scores and parts Arrangiert von Cara S.
Concertos Nos.2, 5, 8, 11, for oboe and cembalo (or piano) - scores and part Arrangiert von Cara S.
Concertos Nos.3, 6, 9, 12 for two oboes and cembalo - scores and parts Arrangiert von Cara S.
Four Concertos for violin and cembalo (or piano) - scores and part Arrangiert von Cara S.